The price of a website varies enormously, depending on the functionality you want. The range stretches from a simple ‘brochure’ site through to a full-blown e-commerce site, along with a support forum, a Q and A section, an integrated ‘latest news’ section, a chat feature and a trouble ticketing system – and there are a gazillion shades in between. 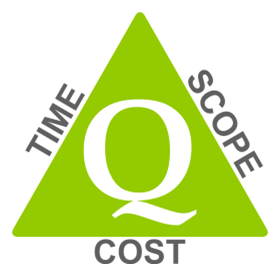 As the image above indicates: the cost is driven by the scope of the project and the time it takes to complete. So it is impossible for us to give you a price until we know what you’re looking for. Our usual approach is to charge a fee for the development and implementation of the website, but we are also open to other approaches and happy to discuss alternatives. So, for our usual approach, the way we look at pricing is to discuss your precise requirements with you and, during those discussions, we will highlight any functionality you raise that will add serious cost. If possible, we will recommend more cost-effective ways of achieving your objective. Once we’ve had those discussions we will put together a detailed quotation that lists each item and its related cost, so you can see exactly what’s what. And, of course, we are very happy to review and discuss each of those items line-by-line and, if necessary, remove items that you feel do not add value for you. Along with that quotation we will also send you a copy of our standard website development agreement. This will show you exactly how we will approach the development of your website and our overall business relationship. We welcome questions and discussion on either or both documents if anything is not clear, or if you would like to discuss any particular aspects. As we’ve said in many places on this site, Abledragon designs all the sites we build from scratch – each one is bespoke. We use the Thesis design framework to do this, and that enables us to ensure that your site is well coded, loads quickly, is stable, is secure and is designed to your precise requirements. However, there is another option which can be cheaper, but carries a number of downsides: you could research WordPress themes, find one you like and get us to implement and customise it. The main downside is the risk to the security and stability of your website. The coding of WordPress themes that you can find online varies enormously. Some are well coded, some are poorly coded, some contain lots of unnecessary plugins and some contain spam or malware links. As a result, we do not guarantee the performance of any site where we customise and implement a pre-made theme for you, and we will not host any site built on a theme that we don’t know. A second downside with using a pre-made theme is that you will, inevitably, have to compromise somewhere on your requirements. Commercially available themes often offer a number of options so they often contain built in plugins or functions that may or may not be relevant to your requirements. A particular favourite is to include the Woo Commerce plugin. This is a complex and ‘heavy’ plugin that will slow down your page load times, and we’ve seen themes where deactivating Woo Commerce actually affects the design and layout on pages that have nothing to do with the plugin. None-the-less, if this is the route you want to go, and you understand the downsides, we would be happy to work with you. It could save you money (at least on the initial price of the site!) because, if you find a theme that is close to what you like, customising it may take less time than building a design from scratch. Of course, that depends on how much customisation you want done..! Again, though, we would not guarantee the performance of a third party theme. So if you have problems with it in the future (a plugin clash, for example) we would also charge you for fixing that. As with most things in life, you get what you pay for – and cheaper often turns out to be more expensive in the long run! What goes into developing a new website based on WordPress? To give you an idea of what’s involved in pricing a new website we point you to these pages: click here and here. Those articles explain just what goes into creating an effective website that will repay its investment. It’s always useful to hear what other people say about our service, since we are obviously biased..! To see some comments others have been kind enough to make please click here. Martin Malden – Director and Owner, Abledragon.